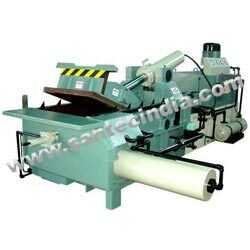 Hydraulic scrap bailing presses are capable of compressing various leftover, housing of junk, cab, metal structural, metallic chips into cuboid bales. The density of these bales is high, so that they are convenient to store, transportation & metallurgy. These systems can be manual hand lever operated, push button operated or automatic / PLC (programmable) control operated. Lower maintenance & low energy consumption ensure effective production.